What began as a congenial resignation by water company supervisor Keith Pennay at Tuesday evening’s meeting of Laceyville Borough Council ended in a heated exchange. Pennay had prepared a printed file of reports previously submitted solely via email. He said that he felt that it was right for him to step down from the mostly unpaid position because he has not been able to put enough time into it. Pennay offered to continue to deliver water samples to the Kirby Health Center in Wilkes-Barre and submit time sheets for it. His resignation was accepted with regrets by board members who thanked him for his years of service to the community. “I don’t like it, but I’ll make the motion to accept it,” said council member Kristi Fassett, who volunteered to work with Pennay in the coming weeks to learn how to prepare and file monthly reports to the PA Department of Environmental Protection (DEP). Fassett will also act as the borough’s official government contact for DEP. “You got the borough through its water woes,” she added, in reference to Pennay’s handling of past reservoir issues. Council chair Randy Brigham cited Pennay for convincing the previous council that Laceyville needed a full time employee to monitor water infrastructure when he brought in Jaye Butler, who is credited for bringing costly system leaks under control. Then Pennay asked about a substantial amount of Act 13 funds that had been put into the borough’s water account in 2016 to serve as matching funds for grant applications. In 2017, he noted, approximately $7,000 of that was removed from the water fund for the purchase of a police car that now sits idle outside the borough offices because the council disbanded the police force at the beginning of the year. “We were applying for a grant, and now it looks like the water company is in the red,” Pennay stated. The water system is currently stable and meets regulation, but the work he and Butler started hasn’t been completed, he cautioned the council. Council member Henry Laborante explained that the purchase of the police cruiser was a response to an emergency situation whereas the police officer the borough then employed was patrolling the borough on foot. “God forbid, if he was involved in a shootout, we did not want him to have to run away, rather than driving away or having a vehicle to protect him.” Laborante added that the borough intends to bring back the police department as soon as it is economically feasible. In the meantime, mayor Phil Brewer noted that he has been among those trying to keep the vehicle in running order. Pennay suggested that future Act 13 funds be placed in a dedicated account rather than depositing them where it seems best at the time and then moving them around. He was on council in 2016 and voted to put the money in the water account and was offended that the new council members moved it without understanding the reasons for it having been put there. New borough secretary Gloria Milliron asked about the details of the motion to which Pennay was referring of taking the money from the water account to use for the police car, asking if, when they did so, they also stated that it was council’s intention to put it back. While council members were in general agreement that they always hoped to put it back, their intentions had never been stated as a matter of record. The ensuing exchange between Pennay and council members did little to appease him, and he abruptly left the meeting without another word and sped out of the parking lot. 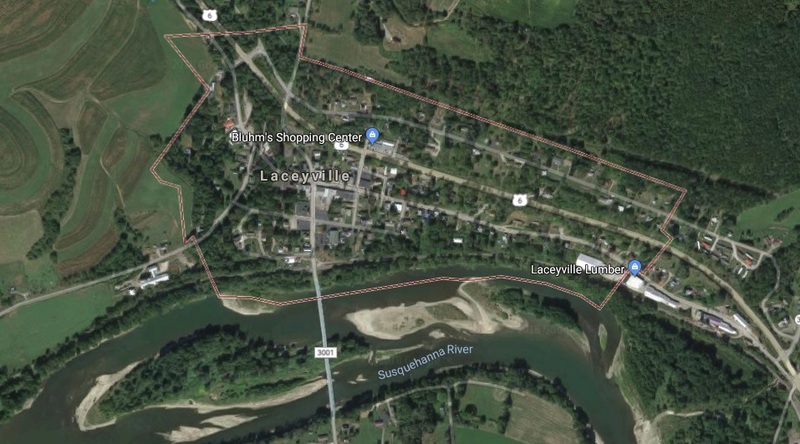 Laceyville Council was informed via a letter that its application for a Multi-Modal Transportation Funds grant to replace the Franklin Street bridge had been denied because requests for the money from across the state exceeded the available funds. Council president Randy Brigham said the borough will consult its engineers to see what other options may be available. In the meantime, Franklin Street will remain closed to through traffic. Brigham updated the council on his efforts to fix the rain water runoff issues at the west end of town at the lowest possible cost, noting that he had found a pair of drain sluices in Wysox for about $500 and grates for under $200. A representative from Clarks Excavating gave him a tentative estimate of $3,000 for installation of both, which would bring the project well under the original estimate of $8,000. Fassett said that it would be best for council to have an estimate in writing before the work begins, as well as a bill of sale from Wysox Precast. The borough will soon be advertising for mowing bids, but current plans to purchase a mower will result in a lesser need for contractors this year. An outside mowing company will still be needed to clear around the borough’s two welcome signs on Route 6 once per month and the area around the borough offices known as Wiles Park every other week. The request for bids will be advertised. “We’re moving forward,” Brigham said of the efforts to find and finance a mower. A dump truck would also be a big asset to the borough, he added. In the meantime, council credited Dave Brown for his recent assistance with maintenance, as well as Robbie Wiles, who they indicated has been cleaning drains for free. Brigham recommended sending Wiles a thank you card for now and seeing if there is a little money left in the budget at the end of the year to give him a gift for his appreciated efforts. The borough has received and deposited $13,472 in state liquid fuel funds, but council notes that none of that amount is part of the $220,000 retrieved by the Wyoming County officials after the infamous accusation by state auditor general Eugene DePasquale that the county had not submitted its disbursement forms for more than a decade. Council members wondered aloud what had become of those funds if the county does indeed have the money. Milliron’s offer to update the water files and move them a separate book was well-received. “For the ease of reference, that should be in a separate book,” Fassett remarked. Further discussion on the matter led to a consensus that water and sewer records could be included in the same volume. Toby Kingsman’s Eagle Scout ceremony will be held on April 28, and Brewer a Brigham offered to attend to represent the borough, for which Kingsman did several street projects to fulfill his requirements for the recognition. A June 1 trash pickup day was announced. The work will be conducted by River Valley Waste Management of Wyalusing, and details are forthcoming. The installation of a new phone system in the borough office is underway, but there are a number of bugs yet to be worked out. The new borough office number is 570-721-3179. The new fax number is 570-469-4101, but that may be temporary. The changes will eventually save the borough about $250 per month.